Scaredy Kat & Her Own Crow: BECAUSE NICE MATTERS! 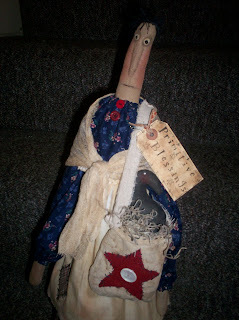 I made this primitive doll for my Computer Instructor who volunteers her time and teaches us for free. Ive taken 3 consequtive weeks with "Sharon" and signed up for another session. I made her about 21 inches tall, black floss hair, a muslin apron, and blue print dress, with a primitive bag w/ a star handstitched on it, and its full of moss w/ a crow sitting in it. I grunged a tag that says "Primitive Blessing" I hope she likes it and remembers how her time, patience, & passion for teaching helped inspire me to celebrate mine and bless her as shed blessed me! It certainly didnt seem enough when at the end of this session she asked us if we'd be willing to answer a few questions on her evaluation sheet that she needed to submit to her boss. I was a little disappointed & saddened that the other 2 students thought it was funny and or sufficient enough to answer just "yes" to the questions on this sheet, so they could scoot out of there. Was there anything we felt we'd like to learn more about? Did we have enough one on one attention? The others didnt see or perhaps care enough to see her expression drooped a little when all they did was give minimal answers. I could tell she felt stung! I mean this woman went above and beyond the call of duty for us. Our clases were only supposed to run for an hour, yet Sharon always asked us if it would be alright if we went over an extra half hour? I mean all she wanted to do was make sure we were learning and learn we did. She always made sure we left feeling satisfied in whatever wed learned during each class. I just couldnt recieve her gift of knowledge with a one word answer. Im going to write her boss a thank you note for the excellent quality of computer time we all recieved. I also know being the Town Librarian and Historian, that perhaps shed enjoy recieving a handmade primitive doll that I made for her in appreciation for the 3 weeks of excellent instruction on the computer.She also encouraged and invited us back for a few more weeks after we took a week break. Everyone signed up, yet no one thought to express their gratitude in this "gimme gimme... my names Jimmy" world we live in! I just think its time we begin remembering how important it is to honor those who lighten our load. I am so sick & tired of my community, our society, as a whole acting as if no one cares. That good customer service or recognition doesnt matter when it does. Sometimes just a smile and a thank you makes my day so much sweeter. Ya know, I want to surprize Sharon because after those lame answers on her eval. I could see her spirit take a dive for a minute before she revived herself. I want her to know that what she did for me mattered in a big way. Because Nice Matters! Hello Kat..I'm so GLAD you stopped by to say hello. I'm throwing your name in the hat for my drawing! What a sweet thing you did for your instructor...you are so right...Nice does matter! Kat...not everyone out there even cares about saying hello or good morning anymore! If everyone just smiled more and had manners life would much nicer! But you and a small amount of others go out of their way to make some one feel special and appreciated..I guess we know whats its like to know both sides of the coin! WE found out NICE MATTERS! manners cost nothing and yet no one uses them!